My reflection walks across the windows outside a McLaren showroom. The cars stare at me through the glass, their bright paint polished to the last curve, orange and yellow, their gull-wing doors open and raised, everything shines. They are slick, thin machines, almost frail looking, built for speed and displaying wealth. Each car could buy a house in my home town. I catch my face in the reflection of the glass and it seems an unwelcome intrusion into their world. Rolls Royces look like thick-jawed brawlers in their showroom. Their square frames seem content to growl at aerodynamics rather than bow an inch to physics. They are heavy set and dense with muted colors that say wealth, but don’t want to scream it, like they want you to know while pretending not to care. I walk on, past Bentleys, past Ferraris, past glistening paint and polised metal, past fur coats and rising towers, past quiet stares and looks from police that seem to linger a bit too long. Giant yachts fill the harbor. Ships worth millions sit one after another. People crowd around as rally cars roar down the street. No one looks like me. No one has a pack with ripped pockets, a scraggly beard, or skin coated with yesterday’s dirt. Everyone smells like soap and perfume. Their clothes all look fresh of designer racks. Their eyes all shift to avoid me as if terrified I might look back and they’ll see a fellow human being. I feel like an alien lost in a sea of strange creatures. I feel like I can’t breathe. The building and streets seem suddenly tight, like they’ll close around me and there won’t be enough air. I don’t feel safe. I slip up a side street, get out of the crowds, and climb higher and higher, wanting to leave the city behind. The streets are a maze of switchbacks and towering buildings. I pick and turn my way up them. A police car drifts by, goes a block past, turns and drifts by again. I try to convince myself they would have turned if I was there or not. I try to believe that, but it rings so hollow and I remember how I was the only one asked for a passport at the French border. The only border I’ve been asked for a passport on the entire trip. I handed it over as cars streamed by without stopping and people walked the sidewalk without a care in the world. I watch the police car coming and I refuse to change anything I’m doing. I am just walking. I am doing nothing wrong. But before I can stop myself, before that thought catches me fully, I raise my hand to waive. A slight nod from an officer’s grim face through the window and they drift by and disappear. I look at my hand and shake my head, not because I waved, I wave and say hello to almost everyone I see, police included, but because this time it wasn’t to say hello, it was to defend myself for doing nothing. I shove my hand back into a pocket and walk away. In a French bakery on top of the hill, I duck out of the rain and the woman behind the counter smiles at me, warm and welcoming. She hands me a sandwich and a baguette after I stumble through ordering in a broken mix of languages and gestures. Then she smiles and nods approval when I manage a decent “merci” after starting with grazie out of habit. I pack the bread into my bag and head back out into the rain. She’ll never know how long I stood outside that store, unsure if I should go in, afraid she’d see me with my beard and backpack and stare as if I didn’t exist at all. 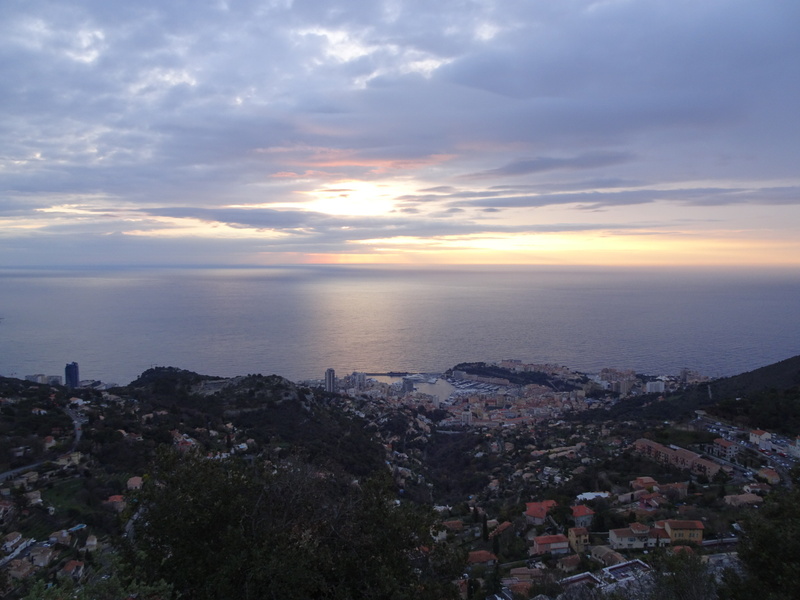 Posted in Europe North to SouthTagged ENS, Europe North to South, featured, France, monacoBookmark the permalink. What different worlds we live in – side by side with each other! The French Patisserie world is one of delights! Yum! Just think of what looks you would have gotten if Theodore Jones was still walking with you. Fear separates us. Still one of the great truths to keep in mind delivered by a great American president: “Only thing we have to fear is fear itself.” Applicable in so many ways. This has happened to you before, while bearded and backpacked, as you moved through places with wealth…ski resoorts and such. Always such a weird feeling. Makes one wonder how many people feel when out of their “hood” and such. The police, the enforcers, the ones on the lookout for trouble. Trouble written all ovr you becausee of the disparity in your “look”. I love the way your wrote this, how cescribed the high class cars, clothes, the beautiful photo of Monaco and the sea. Then, finally the human connection…our daily bread. Love the way you described the contrasts. Yes. Monaco feels a bit uncomfortable to us ordinary mortals who drive Fords and Toyotas, not McLaren’s and Ferraris’s. The country is the size of Central Park in NYC and it is a much different place than the rest of Europe.